2005/7/2 21:24 EDT. International Space Station in an 8-inch Dob telescope. Some details are visible, including the golden solar panel. Hand tracking, 18mm eyepiece/adaptor, Nikon coolpix 995 camera (1/125 second, F3.9, 16-multishot mode, ISO800). 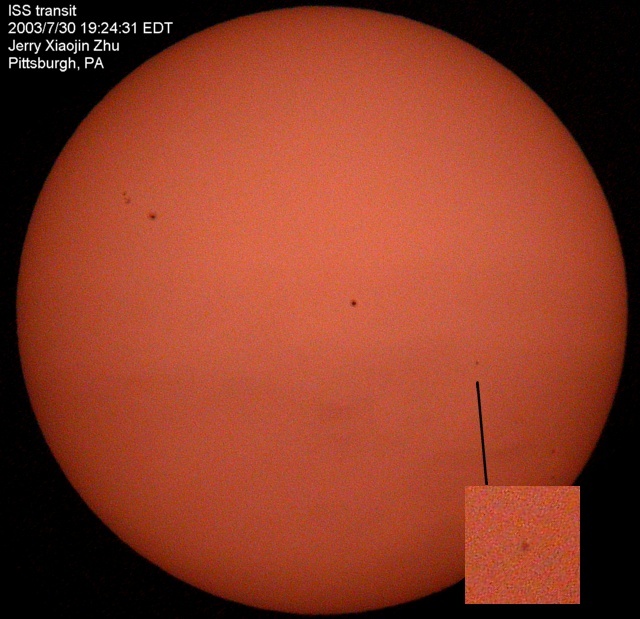 The following ISS transit was predicted by Thomas Fly's online alert program. I used an 8"/f6 Dob + Baader astrosolar filter + 18mm eyepiece/adapter + Nikon coolpix 995 camera. The camera has a continuous mode with about 1 frame per second. I started the exposure 2 seconds before the predicted transit and yes! I got two frames with ISS on it. The Sun was very low (alt 12) with thin clouds, and ISS was 800 miles away, thus not much detail. 1/500 second exposure, F2.6, f8.2mm, ISO 400. 2003/7/30 19:24 EDT. 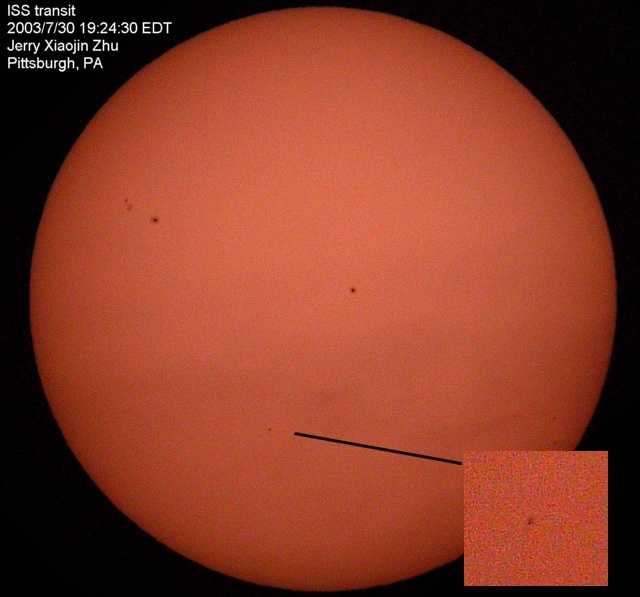 The following ISS transit was predicted by Thomas Fly's online alert program. I used an 8"/f6 Dob + Baader astrosolar filter + 18mm eyepiece/adapter + Nikon coolpix 995 camera. The camera has a continuous mode with about 1 frame per second. I started the exposure 2 seconds before the predicted transit and yes! I got two frames with ISS on it. The Sun was very low (alt 12) with thin clouds, and ISS was 800 miles away, thus not much detail. 1/500 second exposure, F2.6, f8.2mm, ISO 400. ISS and Atlantis (STS-110) made an overhead pass (alt=73, distance=410 km) over Pittsburgh. Amid thin clouds and distant thunder flashes, I captured the following images with 8"/f6 Dob + QuickCam (exposure 255, gain 40). 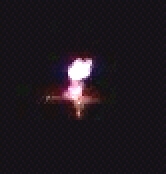 ISS and Atlantis (STS-110) made a higher pass (alt=39, distance=600 km) tonight. Despite scattered clouds and haze, I captured several frames with a 8"/f6 Dob + QuickCam (exposure 255, gain 0). Visually ISS is larger than last time (since it's closer). And some more details can be seen. ISS and docked Atlantis (STS-110) made a low pass (alt. 26 degrees) at 800 km away when I captured the following images. I attached a Logistic QuickCam webcam to an 8"/f6 Dob. I removed the lens from the webcam, and place the webcam at the primary focus. The capture program used 320x240 image size, exposure 255, gain 60. I tracked the satellite by looking into the finder scope and pulling the telescope by hand. Among the several-second video, a dozen or so frames showed some shape. Other frames were either empty or blurred. One thing is for sure: ISS is an elongated object. Tonight is the first time I was able to see the space station through my 8 inch dob and a high power 9mm eyepiece, and resolved some details! First I aimed at it in the finder scope when it just emerged from horizon, so that it was going toward the center of the cross hair. Then I looked into the eyepiece and gently nudged the tube in all directions until ISS rushed into view. It was moving very fast under such high magnification and small field of view, but I was able to keep it in view for about half a minute by constantly adjusting the tube. Even so, most of the time it was jittering so fast in the view and got totally blurred. For a few moments when it was relatively stationary, I was able to see some details. The space station was large! It's about the size of Saturn or Jupiter. The main features were the body and (I think) two solar panels, together they formed a short cross. Amazingly, I could see the two rectangular solar panels very clearly, which had a distinct metal copper-ish color (that is, brown-orange, like that of a new penny). The body was bulkier, more like the body of a spider, and the color was white, brighter than the solar panels. Tip: to search within my pages only, keep inurl:zhuxj in your query. For example, inurl:zhuxj venus transit.